Wintry weather scares many riders off, to the point that during the cold season they hang their bike in the garage: nothing could be more wrong than this. 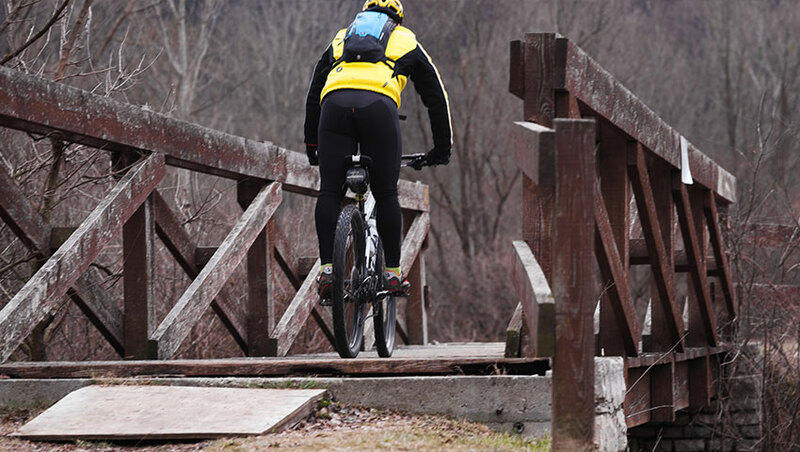 With the 10 tips by Elastic Interface<sup>®</sup> on how to ride your bike during the winter, you will be able to enjoy your rides over frosted trails, on snow, and even in sub-zero temperatures. Motivation, clothing, gear, nutrition, hydration: our 10 tips encompass a vast range of subjects, so that you will never be caught unprepared during a winter ride. Even though there are lots of gyms and swimming pools where you can train in the warmth, a winter bike ride offers a much more profound experience, even compared to a summer ride, and it really needs to be considered as a ‘special event’. You are going to immerse yourself in Nature, far more silent: there are no insects; icy trails crunch under tyre; the breath condenses; ground conditions make you stay focussed while riding. It is likely to see animals that in summer keep out of sight. These are emotions that should be experienced at least once in a lifetime. Given the fact that stress debilitates the immune system, there is nothing better than a bike ride away from work – the humdrum routine, and all those places that are too hot and crowded – to release endorphins and keep away depression and bad mood. This way, the immune system strengthens; just take all the adequate precautions and do not overexert yourself with the intensity of your workout in the outdoors. After you have motivated yourself to go out, proper clothing is of course the most important thing for MTB riding during the winter. The impulse to put on thick and warm garments is strong: simply not the right thing to do. You have to layer up your clothing, making sure you choose breathable fabrics to keep the skin as dry as possible, regardless of the type of route you are tackling. One rule above all other rules: you have to start your ride feeling cold during the first 15 to 20 minutes. Your body, thanks to a process known as thermogenesis will start to generate heat during the exercise. While you are pedalling, you are indeed generating heat. However, in the cold the human body tends to direct the blood towards the vital organs (heart, liver, intestine), leaving the extremities with less blood supply and therefore more subject to get cold. 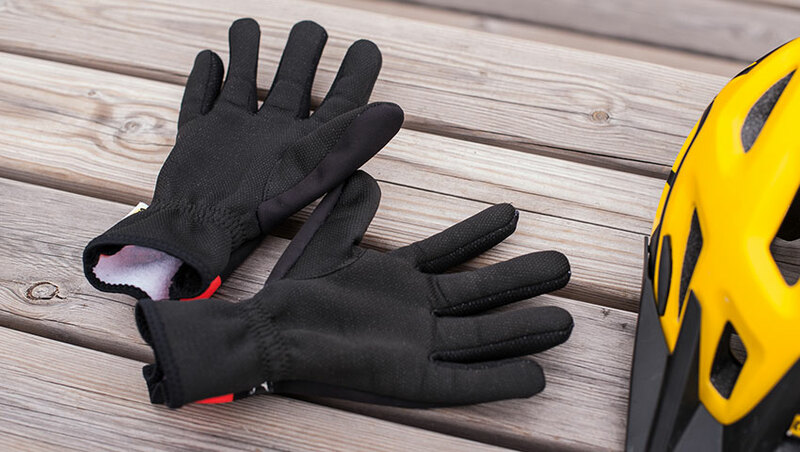 This is the reason why you should properly protect hands, feet, throat and head: depending on the temperature, you can try neoprene MTB winter gloves. If you get very cold, add glove liners in silk or merino wool. For your feet, you will need specific winter shoes; if you ride a lot they are worth the money and they work better than any other temporary solution. Otherwise, shoe covers are another useful solution for XC riding. 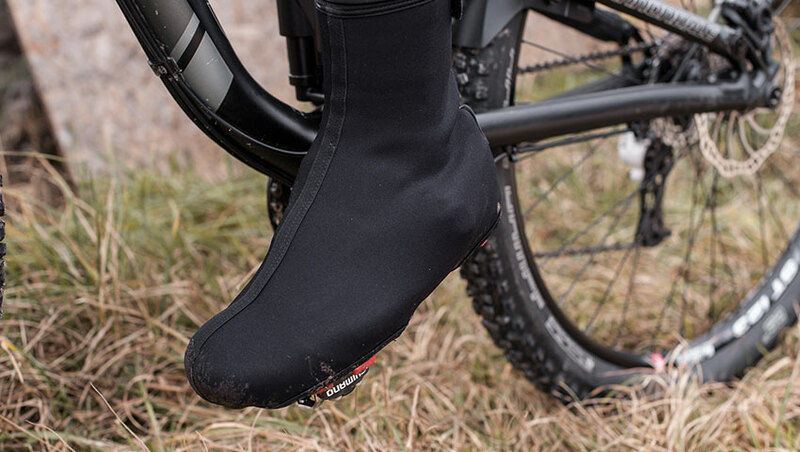 For all mountain and enduro riding, we recommend a good pair of merino socks combined with thermal insoles in a fabric like fleece or wool, fitted in your shoes in place of the original ones. Make use of a fleece neck warmer with a windproof panel on the front. The same thing applies to skull caps, and in this case it is useful to allow for a spare as well, to change it during the ride in case of heavy perspiration. Three layers could be enough for the torso, if they are of good quality: a long-sleeve thermal base layer; a technical snug-fitting softshell; possibly, a packable windproof hardshell for the descents or an unexpected change in the weather conditions. In addition, a windproof vest can be an excellent companion during the winter, provided it has breathable back panels. For your legs, the choice is between a winter bib with quality chamois, to avoid saddle sores, perhaps combined with knee warmers for XC, while for trail riding a pair of shorts or long overtrousers, waterproof but breathable, are essential and they will help prevent the dreaded soggy chamois feeling. The use of kneepads is highly recommended, both to prevent injuries and to keep warm your knee joints. In addition to the helpful hints we gave on how to ride your bike all year long, for example regarding the right MTB fit, during the winter a tyre with a more aggressive tread pattern, able to provide extra grip and clear mud better, is always a good choice. On snow, tyre pressure can be kept lower by a few PSI to increase grip, and a front mudguard may come in useful for particularly muddy rides. Extra care and good maintenance of your MTB after every ride are very important: avoid high-pressure washes though; a bucket with warm water, sponge and brush are to be preferred. Don’t forget to dry well the bike and lube all moving parts (suspension, pivots, clipless pedals, dropper post, transmission) with specific products, such as wet lube on your chain and lithium grease on headset and bottom bracket. Finally, a fabric-specific waterproofing spray over trousers, shoes and jacket does wonders: just apply it overnight and let it penetrate. 7 – Pockets, waist bag or backpack? As we mentioned while talking about long MTB rides, the choice of what to carry will depend on the length of your ride. If it is going to be a short ride with no stops, the jacket pockets or a waist bag should be enough; just don’t forget the water bottle to keep hydrated. During the winter, especially in the case of an all-mountain or enduro longer ride, carrying a backpack is essential: for the added protection to the back it provides and to have extra space for spare gear such as jacket, skull cap and gloves, tools, food, water bladder and a fully charged front light. During the winter rides you should make every effort to drink in small sips and at regular intervals. In cold conditions our thirst response is numbed, but there is no reason to take the risk of dehydrating. Dehydration can cause loss of focus, cramps and decreased performance. Therefore, if you head out with temperatures below zero, allow for a thermo-bottle or an insulated neoprene cover for the hydration-pack tube to prevent water from freezing. 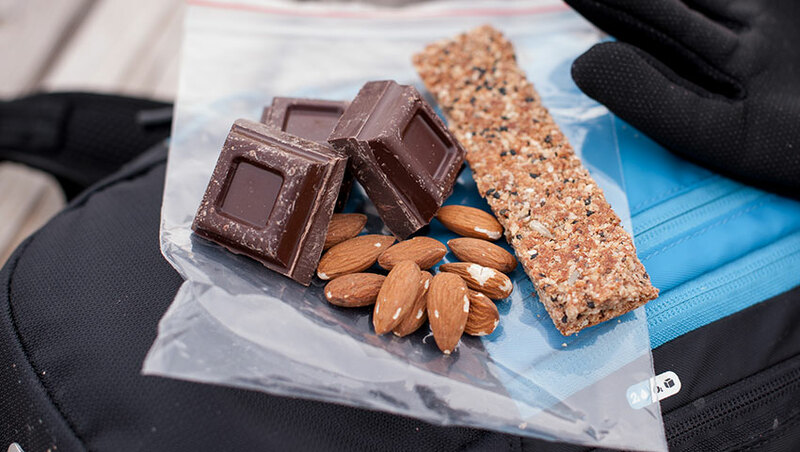 With respect to nutrition, the same rules apply as per usual, but you should consider an increase in calorie burn due to cold conditions: at breakfast you could prioritize foods high in fats and protein and, instead of bars, start carrying with you nuts, chocolate, etc., according to personal taste. Winter rides offer a great chance to discover new places, spots that during the summer are too busy or we have ignored because bike parks were open. Regardless, even a ride in the local woods can offer a very different experience if it is done in muddy conditions or there is snow around. It is useful to consider the possibility of shortening the ride, make detours, or having to make some hike-a-bike. Pre-planning your ride is useful at all times; in winter, it is also important to have a plan B and perhaps a plan C. Getting changed immediately after the ride, possibly in a warm place or at least not outside, is also very important. This could mean the difference between getting sick or not, after your winter ride. The main purpose of every winter ride should always be having fun, but you should also keep in mind that riding during the winter is very good training: ground conditions require more commitment, you learn how to handle your bike over mud, ice and snow, and you are burning more calories because, beside the exercise, your body is working to maintain a constant temperature. Which is why it is nice to share these experiences with your riding buddies, finding more challenges and having fun together. At the end of the ride, you can indulge yourself with something sweet, a cup of hot chocolate or a slice of cake, and this reward will add to the motivations that you will need for your next ride. 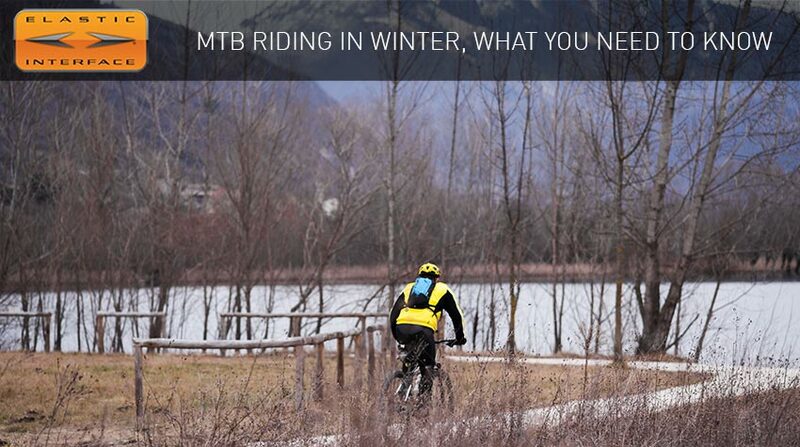 What are your best tips for riding mountain bikes during the winter? 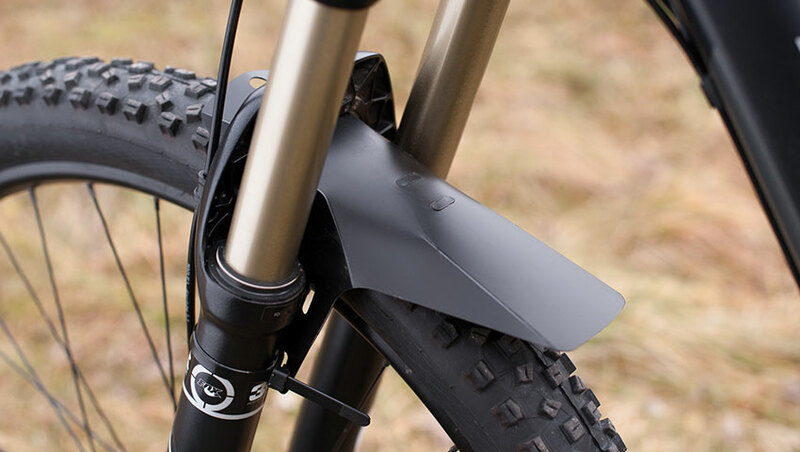 Elastic Interface cycling pads shared a post. We are proud partners of the Italian campaign “Respect the Cyclist”, launched by Paola Gianotti and Marco Cavorso. At least once in a lifetime we all call ourselves "bike riders"... So safety should always be our priority. Help us spread the word - our stickers are almost ready!! Special thanks to Technos srl for the printing.